San Juan Island Kayak Rentals from the Port of Friday Harbor. 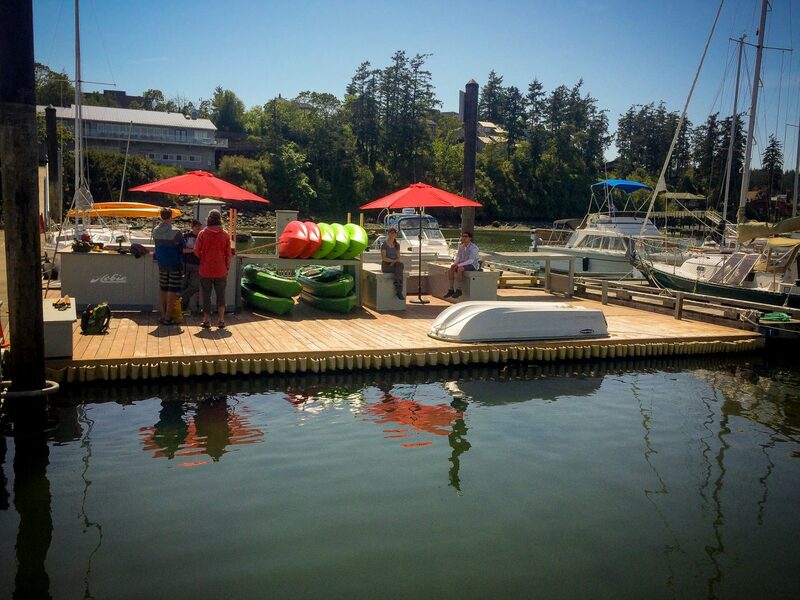 We have a floating dock space where you can rent and launch our sit-on-top kayaks. Explore the calm waters around Brown Island and the shores of San Juan Island. 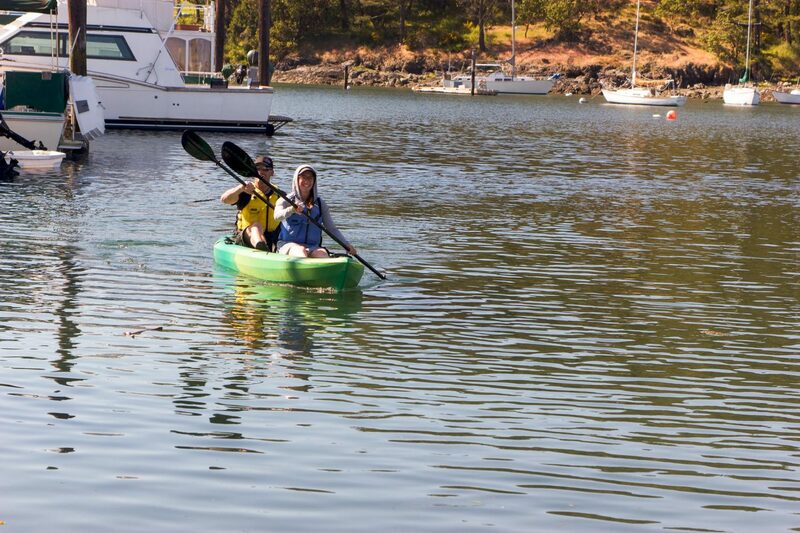 Hourly kayak rentals are a perfect way to spend a bit of time while visiting San Juan Island. 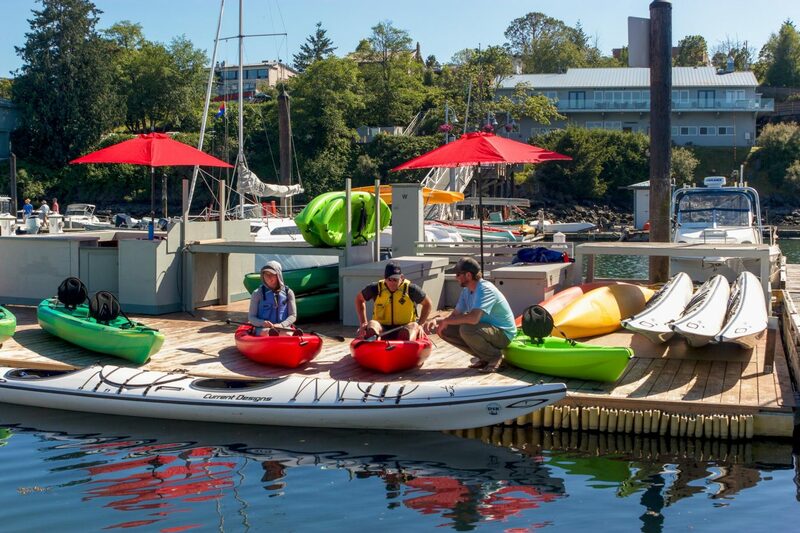 Sit-On-Top renters will get to experience the fun of paddling within the protected waters of Friday Harbor. Our dockside rental program is located in the heart of the marina, just two blocks down from our storefront. 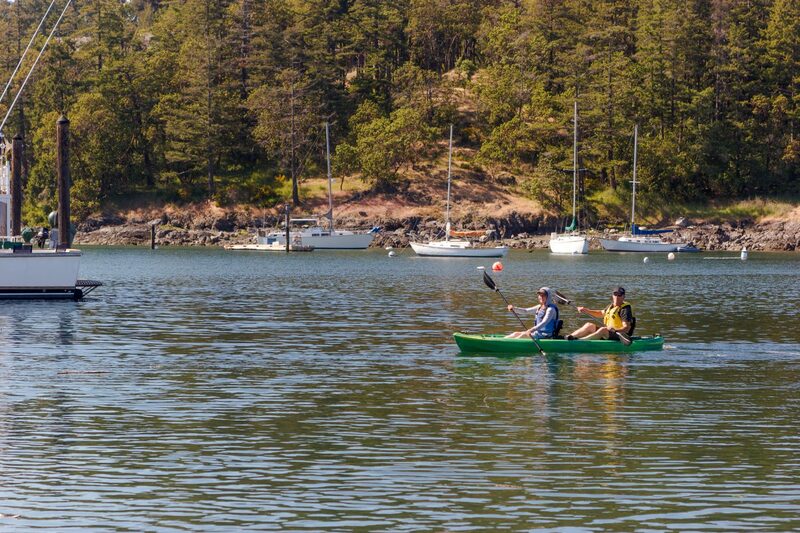 Whether you’re looking for an hour-long activity or several hours of beautiful shoreline exploration, our rental program will help you make the most of your time in Friday Harbor. By starting in the calm water of the marina, paddlers will have the chance to accustom themselves to their boats before making their way to one of the nearby scenic shorelines. The Safe Rental Zone includes a generous area to explore that will keep paddlers entertained for as long as they choose to be out. Just north of our dock space, the property owned by the University of Washington is protected and undeveloped. 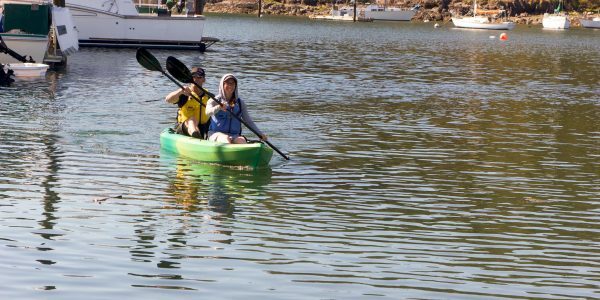 Just a couple minutes paddle away, visitors will be able to enjoy the relatively secluded coves and search for harbor seals, sea stars, and other wildlife. 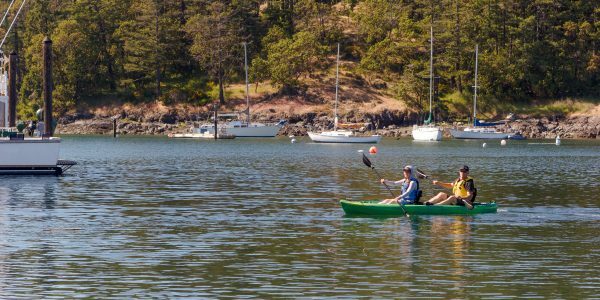 While many waterways in the San Juan Islands can be exposed to unpredictable winds and fast-moving current, the Friday Harbor area is almost always calmer and less challenging to navigate. As such, it makes for the perfect location for un-guided exploration. It is also accessible for younger paddlers. Young participants must weigh at least 60lbs and be accompanied by an adult. By opting for a sit-on-top rental, visitors short on time or with other activities planned throughout the day will find the perfect activity to fit whatever time slot they have. Our friendly staff will help you get acquainted with your boat and gear at the dock, answer any questions you may have, and even give you some suggested paddling areas to explore. Our singles and tandems are stable, comfortable, easy to maneuver, and fun to paddle! Call, reserve online, or simply walk in to start planning your next adventure! 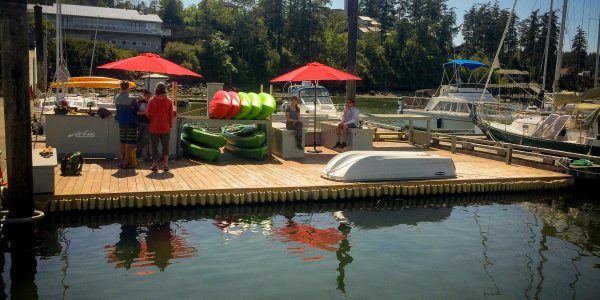 Single sit-on-top rentals are available for an hourly rate and include a paddle and a PFD. Maximum paddler weight is 240lbs. These "Fun-Yaks" are stable, maneuverable, fun, and easy to paddle! Tandem sit-on-tops are available for an hourly rate and include paddles and PFDs. Combined paddler weight must be less than 500lbs. Kids are welcome but must weigh at least 60lbs. 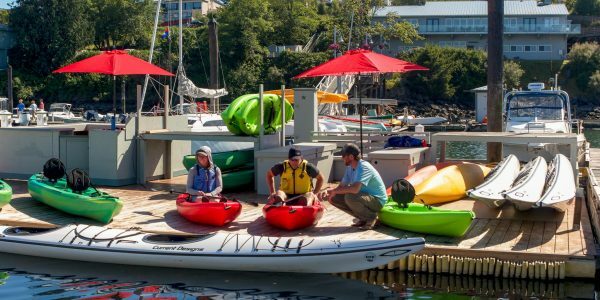 Located just several minutes from our downtown shop location, these rentals are perfect for families or couples looking for an easy way to experience paddling the San Juan Islands. Click photos to view our Dockside Rentals gallery.